Francesco Moser (Italian pronunciation: [ˈmɔːzer] or [moˈzɛr]; German pronunciation: [ˈmoːzɐ]; born 19 June 1951 in Palù di Giovo, Trentino), nicknamed "Lo sceriffo" (The sheriff), is an Italian former professional road bicycle racer. 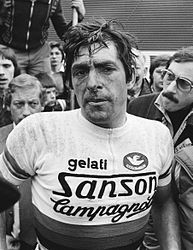 Moser was dominant from the mid-1970s to the early 1980s and won the 1984 Giro d'Italia, the 1977 world road racing championship and six times in three of the five classics. He turned professional in 1973, showing a cultured pedaling style. But his powerful build meant he wasn’t a gifted climber. His 273 road victories puts him behind Eddy Merckx (525) and Rik Van Looy (379), but ahead of Rik Van Steenbergen (270) and Roger De Vlaeminck (255). He was also an accomplished track rider, riding up to six Six-Day races almost each winter throughout his career. He rode 35, 14 of which with René Pijnen, winning 15. A nephew, Moreno Moser, (born 25 December 1990) is an Italian professional racer, and Francesco's son Ignazio Moser enjoyed success at the junior and amateur levels before retiring at the age of 22.